Construction spending totaled $1.280 trillion at a seasonally adjusted annual rate in January, up 1.3% from the downwardly revised December estimate and up just 0.3% year-over-year (y/y) from January 2018, the Census Bureau reported on Wednesday. Public construction spending jumped 4.9% for the month and 8.0% y/y. Of the three largest public segments, highway and street construction—which can be affected by unusually mild or harsh winter weather—soared 12% for the month and 13% y/y; educational rose 2.2% and 8.1%, respectively; and transportation, 3.1% and 7.2% (18% y/y for state and local airport construction and -0.7% for other public transportation—port, transit and passenger rail). Private nonresidential construction spending gained 0.8% and 2.4%, respectively. Of the largest components, power was unchanged for the month but rose 2.5% y/y (-0.8% y/y for electric power and 13% for oil and gas pipelines and field structures); commercial, 1.5% and -4.7%, respectively (with retail categories down 14% y/y and warehouse up 6.1%); manufacturing, -1.0% and 3.7%; and office, 1.8% and 7.6%. Private residential spending slid 0.3% in January and 5.6% y/y. New multifamily construction rose 1.4% and 13%, respectively; new single-family construction, -0.7% and -7.2%; and residential improvements, -0.3% and -8.8%. The producer price index (PPI) for final demand in February, not seasonally adjusted, increased 0.3% from January and 1.9% y/y from February 2018, the Bureau of Labor Statistics (BLS) reported on Wednesday. AGC posted tables and an explanation focusing on construction prices and costs. Final demand includes goods, services and five types of buildings that BLS says make up 31% of total nonresidential construction. The PPI for new nonresidential building construction—a measure of the price that contractors say they would charge to build a fixed set of buildings—dipped 0.1% for the month but increased 5.1% y/y. Increases ranged from 3.2% y/y for warehouses to 4.8% for offices, 5.2% for health care buildings, 5.3% for schools and 5.9% for industrial buildings. Increases in PPIs for subcontractors' new, repair and maintenance work on nonresidential buildings ranged from 2.0% y/y for roofing contractors to 3.7% for electrical contractors, 4.9% for plumbing contractors and 6.0% for concrete contractors. The PPI for inputs to construction—excluding capital investment, labor and imports—increased 0.4% for the month and 2.4% y/y. This index covers both goods (56%) and services (44%). The PPI for energy inputs to construction jumped 5.8% for the month but fell 11% y/y. The PPI for nonenergy goods inputs rose 0.2% and 3.9%, respectively, and the PPI for services inputs, -0.4% and 2.9%. 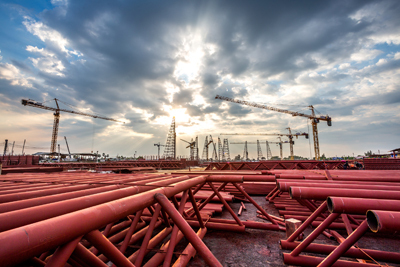 Inputs important to construction with large one- or 12-month price changes include steel mill products, -3.2% and 13%, respectively; asphalt felts and coatings, -0.5% and 12%; architectural coatings, 1.7% and 9.2%; construction machinery and equipment, 0.1% and 6.1%; insulation materials, 0.3% and 5.9%; truck transportation of freight, -0.3% and 5.5%; paving mixtures and blocks, -0.1% and 5.4%; diesel, 8.4% and -3.9%; gypsum products, -0.4% and -7.4%; copper and brass mill shapes, 3.7% and -8.2%; and lumber and plywood, 2.0% and -8.7%. There were 302,000 job openings in construction at the end of January, not seasonally adjusted, a jump of 57,000 (23%) from January 2018, and the highest January total in the series' 19-year history, BLS reported today in its latest Job Openings and Labor Turnover Survey (JOLTS) release. The industryhired 395,000 employees in January, not seasonally adjusted, the largest January total since 2006. Together, the hires and openings figures imply that demand for workers is growing but is becoming harder to satisfy. The JOLTS report showed 2.4% of construction employees quit in January, the highest January quit rate since 2006, which is consistent with a market in which workers can easily find another job. Construction employment, not seasonally adjusted, increased between January 2018 and January 2019 in 275 (76%) of the 358 metro areas (including divisions of larger metros) for which BLS provides construction employment data, fell in 39 (11%) and was unchanged in 44, according to an AGC analysis released today. (BLS combines mining and logging with construction in most metros to avoid disclosing data about industries with few employers.) The largest gain occurred in Phoenix-Mesa-Scottsdale (12,300 construction jobs, 10%). The largest percentage gain was in Chico, Calif. (25%, 900 combined jobs). The largest job loss was in San Jose-Sunnyvale-Santa Clara (-3,000 construction jobs, -6%). The largest percentage loss took place in Danville, Ill. (-20%, -100 combined jobs). Employment hit a record high for January in 82 metros (dating back in most areas to 1990); three areas set a new January low.